Commentary: Time to allocate out of stable value funds? Stable value funds continue to be by far the largest investment type for 401(k) participants who seek low risk and a reasonable return. Stable value balances are estimated to be more than $300 billion and growing. However, rising interest rates are creating problems for some of the largest stable value funds, which reflect in rates paid to participants that are less than money market funds and bank deposits. Participants in 401(k) plans may need to reallocate to money funds or FDIC insured deposit alternatives. 'Stick to the plan' best advice when market volatility strikes Auto drawdown on way to becoming new mainstay Participants react to December drop — or did they? For example, Wells Fargo Stable Value Fund, one of the largest with about $26 billion in assets, currently has about the same yield as a comparable Fidelity Money Market Fund, based on most recently reported Wells Fargo data as of Nov. 30 and Fidelity data as of Jan. 15. The comparison on the surface isn't equitable because the Fidelity fund has had the full benefit of the December 2018 25-basis-point rate hike, while the December Wells Fargo numbers have had two weeks less to absorb those increases. However, after years of having a substantial performance advantage over money market funds, stable value returns have converged. Other major stable value funds such as Morley Capital Management have had similar, and in some cases, worse results. However, our estimates are this gap will grow to more than 60 basis points by mid-year 2019. The analysis assumes two further rate hikes of 25 basis points over the next five months. The money market fund will benefit from the full 50-basis-point increase and gross yield will improve to about 3% from 2.44%. The Wells Fargo Stable Value Fund, however, will capture something less, possibly as little as 15 or 20 basis points of the increase. This is due to the built-in lag in response to rising rates built into the stable value contract structure. 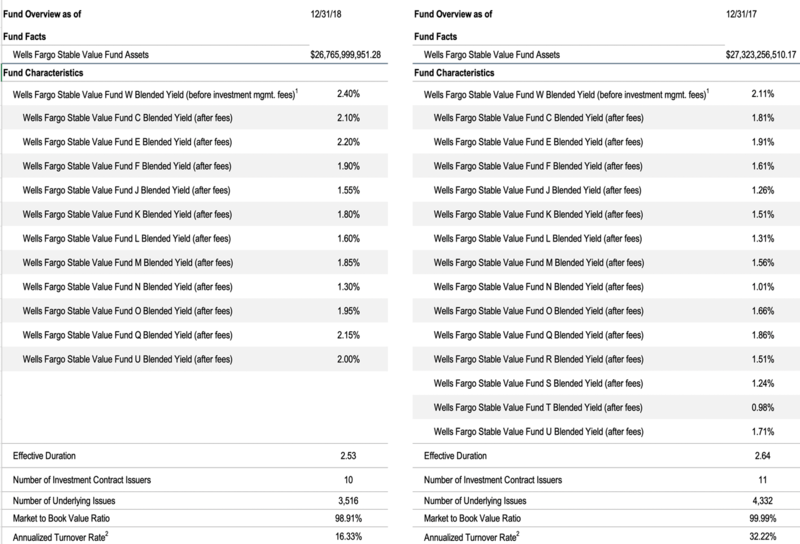 A deeper dive into the Wells Fargo fund shows the change in yield and the market-to-book value of the fund between December 2017 and November 2018. Over this period, Wells Fargo Stable Value Fund C, for example, gained 27 basis points at a time when the money funds were gaining 80 basis points. Note the market-to-book value ratio of 98.91% as of November 2018. We expect this to worsen as rates increase, further reducing participant return, forcing the fund to take additional writedowns against the customer net yield paid. In our analysis we assume a 40-basis-point writedown. Two other factors should give an adviser or fiduciary pause to continue to recommend stable value: capacity and stability. It isn't well-known, but several stable value funds have either been bankrupt or sued over low participant payouts. The weakness was largely due to broader issues during the financial crisis when these funds had to actually write down a 100% loss on securities the fund was holding. More severe than today's situation, but starkly in contrast to the safety of FDIC insured product options. It also isn't well-known that stable value capacity is limited. Relatively few insurance companies provide the credit and liquidity wrappers stable value funds require to be plausibly stable. Capacity was hard to find during the crisis and could be hard to find again in the near future. Sooner or later, investor confidence in equity portions of retirement portfolios will enter a correction phase. Participants will want to reallocate to cash product options, pouring billions of new dollars into the stable value product. If the fund can't keep up with capacity, where will those dollars go? Henry Heitman is president of Insured Retirement Investments LLC, Edina, Minn. This content represents the views of the author. It was submitted and edited under Pensions & Investments guidelines, but is not a product of P&I's editorial team.